On 13 April, 1919, the British Indian Army, commanded by Colonel Reginald Dyer, shot dead Baisakhi pilgrims and non-violent protesters in Amritsar’s Jallianwala Bagh. Almost over nine hundred people were killed instantly and over a thousand were badly wounded. This has been one of the incidents that no Indian will ever forget. Even British Prime Minister Theresa May has called the Jallianwala Bagh massacre a ‘shameful scar’ on British-Indian history. 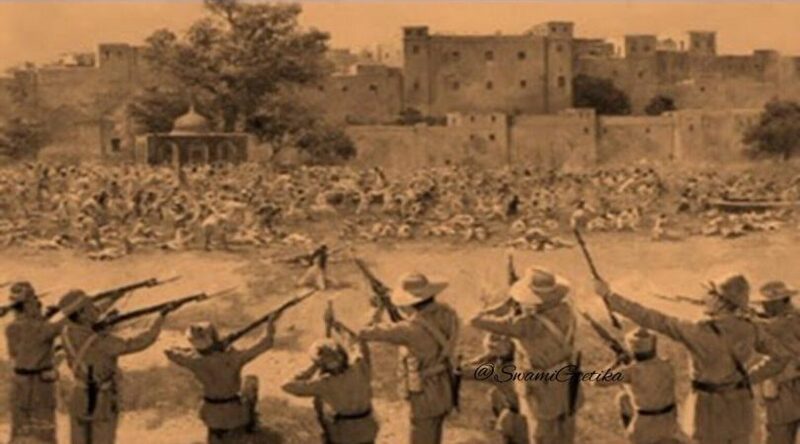 The British troops blocked the entry to the Jallianwala Bagh and even locked the exit after which they fired continuously for ten minutes, killing and injuring innocent people.People tried to flee and to save themselves some even jumped into the well. It was a sad day in Indian history. Filmmakers have been paying tribute to this gruesome, cold blooded by talking about it and portraying it in their films for the generations to see and know about it. Here are some films that have portrayed the massacre. The most recent portrayal of the Jallianwala Bagh Massacre was in the Anushka Sharma, Diljit Dosanjh starrer Phillauri. The film portrays the massacre and the stampede that followed during the Jallianwala Bagh attack. The film was shot at the Jallianwala Bagh memorial. Shashi’s (Anushaka) spirit is unable to find freedom and peace since her lover (Diljit) lost his life during the massacre, while Sashi all dressed as a bride waited for him to come for their wedding. The film also stars Suraj Sharma, and Mehreen Pirzada. Rang De Basanti starring Aamir Khan, Sidharth, Atul Kulkarni, Sharman Joshi and Kunal Kapoor showcased Jallianwala Bagh massacre in one of the black-and-white sequences in the film, Though not about the Jallianwala Bagh massacre, the film does touch upon the topic of the massacre. Jallianwala Bagh : What Happened After The Massacre? Produced and directed by Balraj Tah, the film showed the build up to and the aftermath of the Jallianwala Bagh massacre. The film stars the late Vinod Khanna, Parikshat Sahni, Shabana Azmi, Sampooran Singh Gulzar, and Deepti Naval. In the Richard Attenborough’s portrayal of Mahatma Gandhi which released in1982, the massacre has been chronicled well. The film portrays an accurate description of the massacre, where the role of General Dyer is played by Edward Fox. The film also shows the inquiry by the Montague commission post the massacre. Ajay Devgn starrer, The Legend of Bhagat Singh, directed by Rajkumar Santoshi is about Bhagat Singh’s life as a freedom fighter and it also shows us how Bhagat Singh took a vow to free India from the British rule, after he witnessed the Jallianwala Bagh Massacre. The film also stars Sushant Singh, D Santosh and Akhilendra Mishra in lead roles. Salman Rushdie’s novel Midnight’s Children is about India’s independence. Midnight’s Children the film is an adaptation of the same novel. Directed by Deepa Mehta, is in the context of actual historical events during that time. The movie has a few scenes of the Jallianwala Bagh Massacre. The film features Shriya Saran, Satya Bhabha, Siddharth Narayan, Ronit Roy, Shabana Azmi, Anupam Kher, Shahana Goswami, Soha Ali Khan, Rahul Bose, Anita Majumdar, Darsheel Safary and Kulbhushan Kharbanda. Even though the Jallianwala Bagh massacre took place years back in 1919, these movies remind us of what the innocent people went through and the scars still remain. Previous articleIs It Right To Share Details Of Your Salary With Colleagues?